Pokédex Entry "Its wings can carry this Pokémon close to an altitude of 4,600 feet. It blows out fire at very high temperatures." History The first thing that Gregory saw when he emerged from his egg were the marvelous golden scales of his sister. Latching eyes onto one another, they began to play for the first time, chasing and play-fighting with one another within the gardens of the Pokemon Daycare Centre in Kanto where they were born. Little did they know that the man whose Hydreigon and Charizard reproduced the little Fire-types was a selfish and greedy individual, who took one look at the female's golden scales and saw it as an opportunity for some extra money. Gregory had just two months of his life to enjoy with his feisty, adventurous sister before she was picked up, tossed into a cage and driven away on the back of a van. Gregory did not know why he had been separated from his sister so suddenly and missed her company immensely, becoming distant from his breeder and the other Pokemon. Having no use for a 'broken-hearted little whelp', the breeder took him to Professor Oak's laboratory in Pallet Town, going so far as to even try and bribe Oak's assistants into taking him off his hands. However, they were more than willing to accept the Charmander for free, and that was how it went on for Greg for the next few years. At first, they began to offer him to young Pokemon Trainers starting out on their journey, but nobody wanted the timid little Charmander and instead chose the cocky Squirtle and energetic Bulbasaur that also lived in the lab. They saw that Greg was saddened, so asked the Charmander if he wouldn't mind accompanying one of the young lab apprentices, James, for a while. Greg was initially confused, but when James took him out into the field to study the wild Pokemon, he enjoyed it a lot. For the next few years, Gregory lived this simple but interesting lifestyle. He loved to learn about all the different Pokemon that he shared his world with, and James occasionally let him battle with some of the Trainers they encountered out on the road, and this eventually allowed him to evolve into Charmeleon. Soon after he took Greg to Professor Oak himself to be evaluated, and he was doing so well he rewarded him with a special gift: a TM for the powerful move Fire Blast. But one day they encountered a rough-looking Trainer who demanded a battle right on the spot. James reluctantly accepted, giving Greg a word of encouragement before letting him onto the battlefield. To Greg's astonishment, the rival Trainer released a golden-scaled Charmeleon. Before Greg could say a word, the aggressive female charged at him, slamming him to the ground and trying to bite at his neck. They locked eyes with one another, just for a moment, and the next thing they knew they were not battling but wrapping their arms around each other in glee - Greg had been reunited with his sister at last. The rival Trainer was furious that the two Charmeleon had began to play with one another and sent out his Nidoking, commanding the Pokemon to attack the female - now named Eris - while withholding all mercy. Without thinking, Greg bravely stepped in front of the rampaging dinosaur and was slashed brutally across the belly. The last thing he saw before passing out was Eris tackling her laughing Trainer to the ground. When he woke up, Eris was tending to Greg's wounds as the two of them hid within a small cave near to Mt.Moon. She told him how she had been sold to that mean-spirited Trainer and had lived a life of hell, being forced to battle opponents far stronger than herself and being beaten if she lost. Greg noticed right away that his sister had lost whatever light-heartedness she had possessed before and was saddened by this somewhat, but he tried to convince himself that they were now free to enjoy their lives as they pleased. He missed his field trips with James though, and hoped that he and Oak was managing OK in the lab without him. Greg and Eris lived together within the mountain for a long time before they began to spot a large number of suspicious-looking people in the area. Eris suggested that they follow and see what they were up to. Employing the help of a friendly Zubat, who offered to act as their spy, they eventually found out that they were hired Pokemon Hunters who had been sent out to find and kill the two of them after the Trainer of Eris was killed in a vicious attack. Realising that Eris had killed her Trainer while trying to protect him, Greg was initially horrified, but decided to let it go until they got away from Mt.Moon. Eris suggested that they tried to sneak out, but Greg did not see how that would work out well - two Charizard with tail flames that illuminated the area around them didn't stand much of a chance against a cave full of people intent on killing them. After being convinced that there was no other way and that they would be found eventually, deciding to give it a go. Greg's mouth hung open in horror as Eris suddenly flew to the roof of the cavern, dodging several bullets in the process, and using Outrage to destroy half of the roof, Greg barely made it out in time as thousands of tonnes of rock crushed half of the party of Hunters. The two Charizard remained in hiding for a few more months until Greg overheard news of a strange disease breaking out in Johto, just over the border. Concerned, he suggested to Eris that they leave Kanto and, to his relief, she listened. They traveled to the ??? region, where they are now seeing the horrors of the infection for themselves. Appearance Other than a long scar on his belly, Gregory is an ordinary Charizard. He wears a Fire Gem around his neck on a string necklace. Personality A calm, kind-hearted and intelligent Pokemon, Gregory is a valuable asset to any team. The Charizard possesses a very open mind and can think or talk his way out of most situations with ease. The never-ending flow of logic and reason that emanates from him is both a blessing and a curse to his sister, as she knows that her brother will always stop her from doing anything rash but will always be right. Greg is remarkably modest, and although he knows that he possesses an impressive moveset thanks to his Hydreigon father and the Professor, he does not like to boast or show off in any way, considering it rude and offensive to others who might not have that privilege. Likewise, he knows that he has more knowledge about the world than the average Pokemon, but will share his knowledge sparingly and only when it is necessary. Greg loves and cares for his sister immensely and, despite his lack of experience of battling, will do anything possible to help protect her. Although he knows that Eris is perfectly capable of defending herself, he is desperately afraid of losing her. The Charizard is a quiet soul, often shy around strangers, and prefers to listen to conversations from a slight distance and only intervenes if he feels it is necessary. Once he gets to know them, Greg's loyalty towards friends is unending, although he will quickly become defensive if any sign of trouble arises. --Greg possesses a 'special' moveset, consisting of moves that allow him to attack from a distance. This moveset is in his favour - since he is not very confident he prefers to help out from a distance while Eris deals with close combat. A Dragon Fang on a string necklace. Eris has a habit of chewing on it when she is nervous or agitated, so it is covered in toothmarks. Pokédex Entry "Breathing intense, hot flames, it can melt almost anything. Its breath inflicts terrible pain on enemies." History The golden-scaled Charmander stared at the blue sky, catching her breath after the struggle of making it out of her egg. Unaware of the small group of people who were gathering around to marvel at her scales, her attention turned to the shaking egg beside her. A foot suddenly emerged, startling her, and then another. Slowly her brother forced his way out of his own egg and they locked eyes for the first time. Instantly, the two baby Charmander knew what they had to do: play! They ran, jumped and play-fought in the garden of the Daycare Centre in which they were born, not knowing that the man whose Pokemon had bred them was looking at the female's golden scales and thinking of all the money he could earn by selling her. At just two months old, she was simply picked up (in the middle of a game of Tag with her brother), locked in a small cage and placed on the back of a van. She cried and shouted for her brother as the van's engine roared to life and dragged her away from him. After a day on the road, with no food or water, the van stopped at a Black Market run by Team Rocket. The little Charmander was thrown out of her cage and into a pen with other Pokemon who had strange colourations. Afraid and ashamed, she curled up as tight as she could and thought of her brother and how much she missed him, barely touching the food she was given. One day a young, rough-looking man arrived at the market and immediately took an interest in the shiny Charmander. "I'll toughen her up," he smirked as she was yanked up inside a net. As she struggled and wriggled and growled her distaste, the man gave her a rotten smile. "I think I'll call you Eris," he said, tossing a Poke Ball at her head and capturing her. He paid a generous amount of money and left. Shortly after, Eris was released from her Poke Ball and found herself cornered by the man and his Nidoking, who looked just about ready to tear her apart. Terrified, she tried to run away, but her new Trainer ordered his Nidoking to restrain her. The huge Pokemon's foot stomped her back to the ground and Damon, her Trainer, told her that there was nowhere to run. "You are mine now," he growled. "I paid good money for you so you will do as I say. GOT IT?!" Desperate to get the Nidoking's large foot off her spine, Eris agreed to co-operate. Within minutes, Damon had found her her first opponent: a Trainer battling with a Fearow. Literally tossed into the battle, the Charmander had no choice but to feebly try and battle the opponent, who was far stronger and faster than she was. Of course, she lost, and got the beating of her life afterwards as a result. The months past and this life did not change. Countless times she was thrown into battle and still most of the opponents were stronger than she was. But bit by bit, she was beginning to improve. Every day she battled harder and harder, almost to the point of exhaustion. She was terrified of losing and the beating that she would receive if she did. It was odd, but after a while she began to enjoy battling. She felt that, every time she won, she was getting stronger. More victories, less beatings. Sometimes she even got rewards after a particularly good day. Even Nidoking seemed to be warming up to her a little. A few years passed and Eris had evolved into a strong Charmeleon by the time the day that would change her life arrived. Damon had come across a young Pokemon researcher out in the wilds near Pallet Town and, naturally, took one look at the Charmeleon he was with and assumed that he was a Trainer too, so asked for a battle. The timid young man accepted, and before she even managed to get a good look at her opponent she had thrown herself at him, determined to win and to avoid a beating. Pinning the weaker Pokemon to the ground, they locked eyes for a moment, and the whole world changed. She was staring into the eyes of her brother. Overcome with euphoria, Eris wrapped her arms around the Pokemon she was supposed to be battling and hugged him tightly while a startled Damon looked on. Eventually snapping out of his confusion, Damon was furious that Eris was disobeying him and sent out Nidoking to give her the "thrashing of a lifetime". Eris was more than ready to counter the brute, but to her surprise her brother intercepted the attack and was left with a horrible gash on his belly. Fury like no other boiled through Eris's blood as she looked at her brother, bleeding and battered on the ground, and the sound of Damon laughing caused her to snap. Realising that she had been working for a monster and, at times, enjoying it, Eris charged at her Trainer, determined to teach this foul creature a lesson he would never forget. Caught completely off guard, Damon was tackled to the ground by his enraged Pokemon, who proceeded to hack her claws into his neck. Finally stopping and realising that she had killed him, Eris was horrified. She had never meant to murder him. Ignoring James and Nidoking, who stood staring at the scene in horror, Eris grabbed a Hyper Potion from Damon's bag, took hold of her injured brother and fled. Finding a small cave not far from Mt.Moon, Eris carefully tried to treat her brother's wound using the Potion, hoping and praying that it would work. After several long, agonising hours, he regained consciousness. While she wrapped soft moss around his torso, they exchanged life stories, and she learned that her brother also had a name: Gregory. The female was incapable of displaying just how much joy she was feeling at not only being free of Damon's cruel clutches, but also being reunited with her dear brother. Little by little, Greg recovered, and the two of them decided to live within the mountain. They lived in peace for many years until, on her way back from a hunt, Eris spotted a group of humans within the main chamber. Resisting the urge to kill them all, she returned to Greg and told him of her sightings. They were overheard by a friendly Zubat, who offered to act as their spy. They soon heard that the humans were in fact a group of Pokemon Hunters and were looking for a black Charizard after having been given orders to hunt down and kill her. Knowing exactly what this was about, Eris finally told Greg about accidentally murdering her Trainer after he had been attacked, and that the Hunters were here to put her down for her crime. She was worried that Greg would be horrified, but thankfully he seemed to put getting out of there alive and safe before anything else. Eris suggested that she tried to make it up to the ceiling and to destroy it with an Outrage. Greg was initially reluctant, and both of them knew that they would attract attention but what choice did they have? Eris was NOT about to let those humans pepper them to the ground with bullets, and so told Greg to hide while she carried out the plan. Thanks to the immense size of the cavern, she managed to make it up to the ceiling undetected. But when her Outrage destroyed it and sent thousands of tonnes of rock raining down, the humans noticed her and started to fire. She screamed down at Greg to fly up with her while barely managing to dodge the gunfire and the falling rock. Relishing in the screams of the humans as they were crushed beneath what once held up an entire cave, Eris took Greg's hand and pulled him outside, and the two flew as far away as they could before exhaustion took over. To her immense relief, Greg forgave her for killing Damon. "What's done is done," he told her. "Let's just focus on what else is to come." Sadly, the tranquil future that they planned never came. Instead the epidemic arrived, and the duo now spend their days simply trying to stay alive. 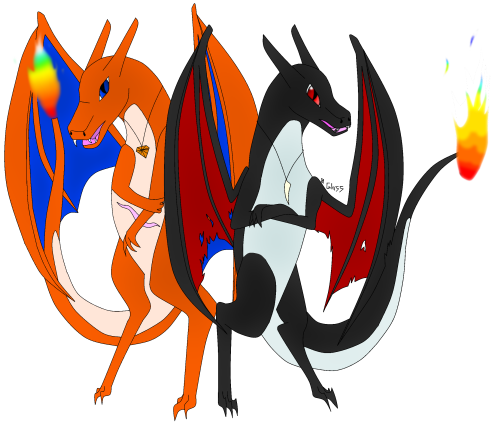 Appearance Being a shiny Charizard, Eris's scales are a dusty black and the undersides of her wings are a deep blood-red. Her eyes are crimson. She has many battle scars on her body and wings, and is tall, lean and athletic. She wears a Dragon Fang on a string necklace. Personality Quick tempered, sarcastic and brutally honest, Eris couldn't be any different from her brother. Her cruel upbringing has turned her into a hardened, over-defensive and emotionally-decrepit social outcast. Unable to show any sympathy, compassion or love for anyone besides her brother, Eris is very difficult to get along with. Caring little for others besides herself and Greg, she becomes very aggressive towards anyone who even barely shows a hint of hostility or contempt towards either of them. Eris adores battling and showing off her skills, but simply refuses to lose due to still having the idea of being beaten if she loses still imprinted in her mind. As such she will fight until she simply cannot fight anymore. The female is sensitive about her unique colouration, knowing full well that it was the reason for her hard life, and it is one of the few issues that she cannot handle herself when confronted or asked about it. She is aware of her impassive, rude and sometimes violent behaviour and as such relies on Greg most of the time to maintain peace. She knows when she has gone too far and will back down, leaving her calmer brother to fix a situation that she has caused. Despite all this, Eris does possess one or two positive qualities. The female has a sense of humour, although quite dark, and is not afraid to use it. She loves to make jokes with Greg, and the two of them have been known to roll about in laughter over something ridiculous. Eris admires the strong; Pokemon who aren't afraid to show off their strength in battle and do not back down from a fight. She also gets along better with Pokemon who can think for themselves and do not cling to others for support. In other words, it is difficult to gain her respect, but not impossible. She loves and cares for Greg dearly, although she rarely physically shows it, and will go berserk if anyone dares to make a mark on him. Just like he is afraid of losing her, she is terrified of losing him, knowing that she would become an unstable wreck without his guidance. --Their father was a Hydreigon. --Eris is the slightly older of the two, being born 4 minutes before her brother. --She despises humans, and is terrified of the Pokemon Nidoking. --In Greek mythology, Eris was the goddess of chaos, strife and discord. --The Dragon Fang was given to her by Damon, as were her two TM moves. Swords Dance replaced the egg move Dragon Pulse in the moveset when it was taught. --These two are inseparable - where one goes the other will always follow. To Inactive for now, please.